Support MI‘s ongoing mission to showcase, interpret and preserve early images of citizen soldiers and sailors in America. An annual print subscription is $24.95 in the U.S. and $50.95 everywhere else—4 quarterly issues. Subscribe for 2 years and save 10 percent. The print + digital edition starts at $29.95. Military Images accepts checks, credit cards and PayPal. Ready to subscribe? Time to renew? SIGN ME UP FOR THE PRINT EDITION! Get the print edition of MI delivered to your mailbox. SIGN ME UP FOR THE PRINT + DIGITAL EDITION! 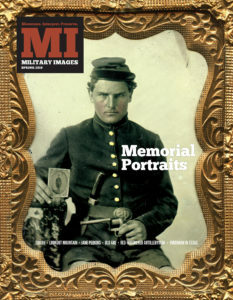 Get the print edition of MI delivered to your mailbox, the downloadable digital edition (PDF) and full access to the web version (militaryimages.atavist.com). Looking for digital only issues? Selected single digital issues are available for purchase in MI‘s Back Issues section. Want to try before you subscribe? Sign up for a trial subscription and receive the next issue of Military Images absolutely free. Following delivery, you’ll receive a subscription form. If you enjoyed the complimentary issue, we hope you will join our army of subscribers.